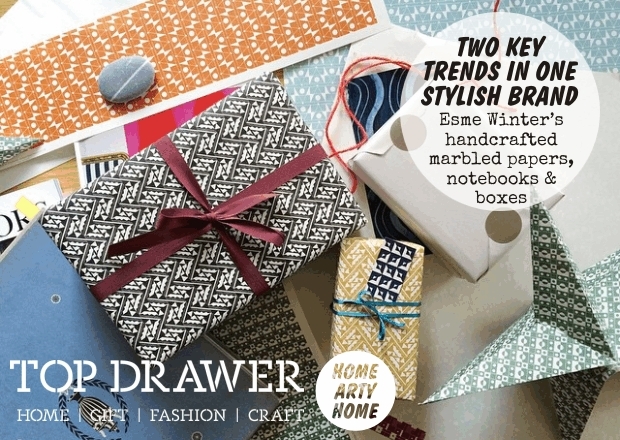 When Home Arty Home visited Top Drawer in September, the art & interiors blog was captivated by the artisan paper goods of exhibitor Esme Winter. Featured in the highlights round-up from the Olympia show, Home Arty Home had to find out more about the range and the process behind the papers. 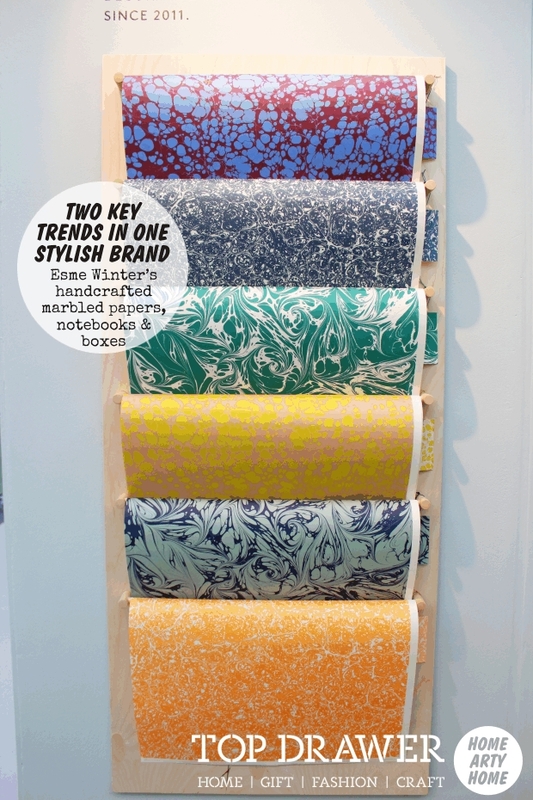 With marbled prints a key trend, Esme Winter produce some of the finest papers using the age-old technique. 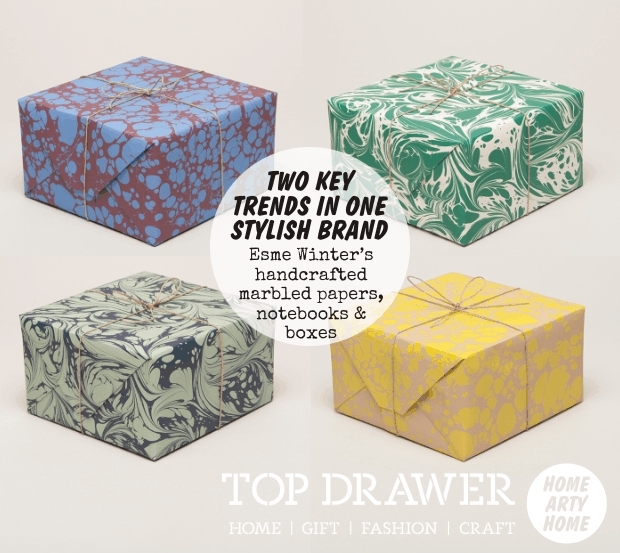 Not so much a trend as a matter of pride in craftsmanship, handcrafted goods are on the rise and Esme Winter’s papers are a prime example, swirled by the hands of artist Jemma Lewis. 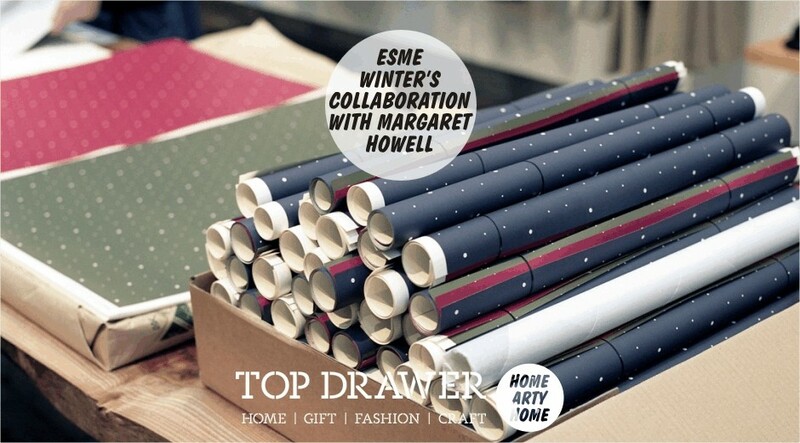 Taking gift wrap to another level, Esme Winter has already collaborated with Margaret Howell and Gio Ponti for Port and their striking products are ideal for fans of the contemporary and the traditional alike. 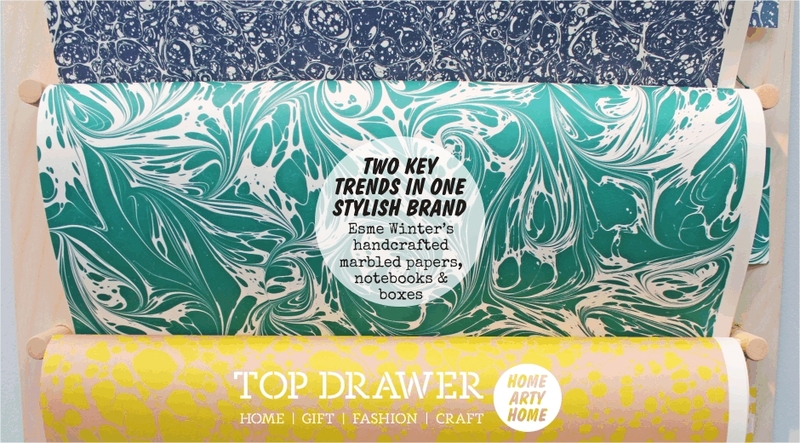 Home Arty Home caught up with Esme Winter to find out more about the people and the process behind the collection which incorporates two key growing trends: marbled papers as well as the continued rise of handmade items. “We officially started in late 2011. As a couple we would often exchange ideas and opinions about our personal freelance work and somewhat sporadically we started to design together. 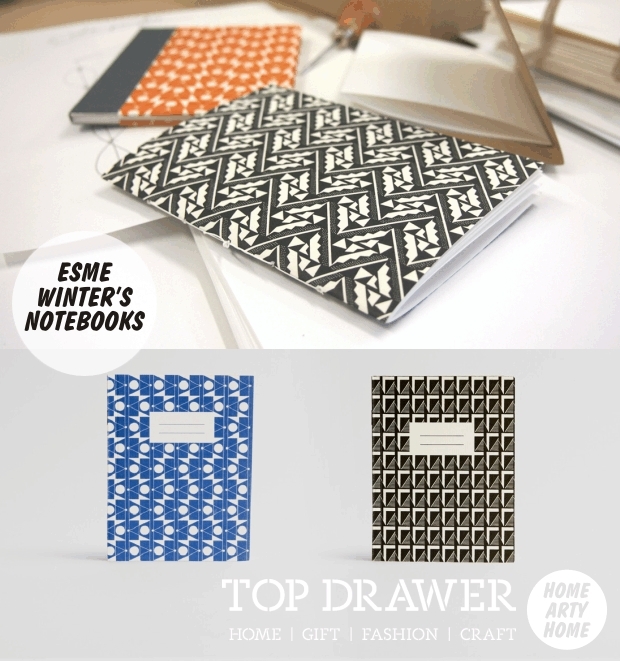 “Our pattern designs initially come about naturally from drawings which will be revisited and developed over time. In a way, each of our designs have their own story, some may have been modified and re-drawn over and over and some just work instantly. Our ‘new’ designs are often very old! 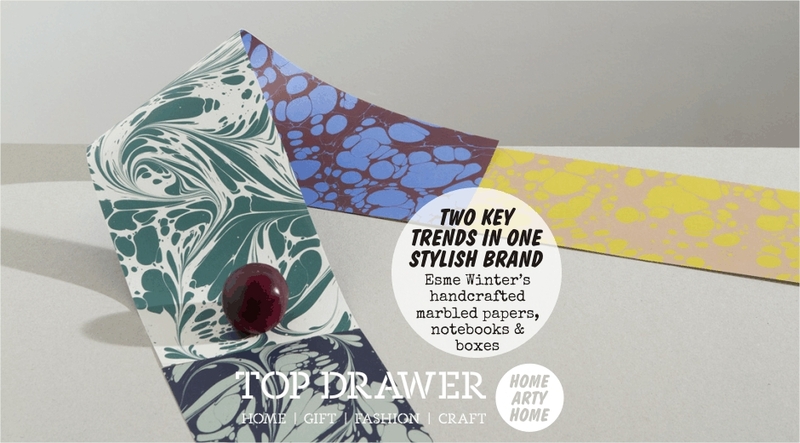 “Our new Marbled Paper collection is a collaboration with Marbled Paper artist Jemma Lewis. Jemma has a great reputation within the antiquarian book trade. 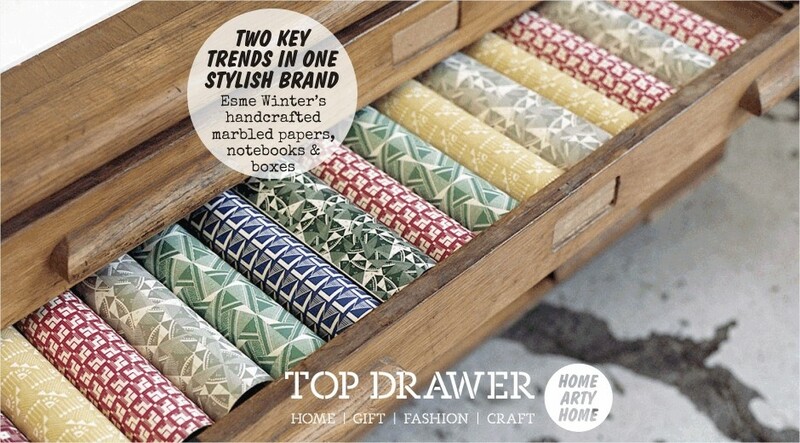 Her original marbled papers are beautiful examples of traditional techniques, all made in her garden shed in rural Wiltshire. Marbling is one of the earliest and most skilled forms of artisan paper decoration and by working with Jemma we have created a range of truly authentic, contemporary marbled papers. 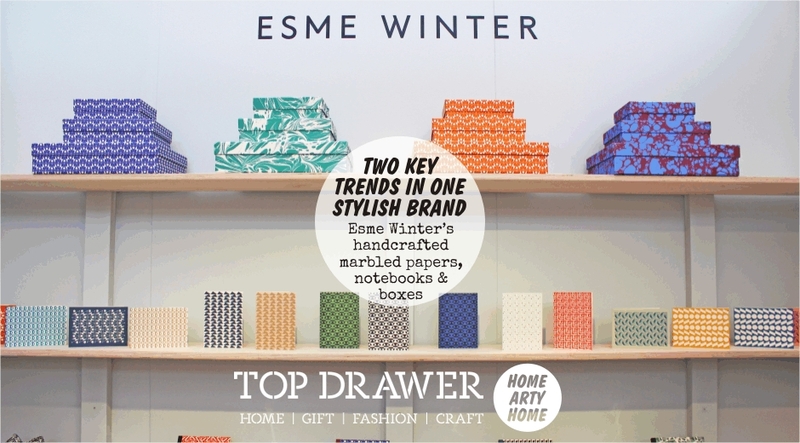 Visit Esme Winter to see more.